Click here for RealAudio version of Meditation, 3:51 / 167K. Click here for TrueSpeech version of Meditation, 3:51 / 177K. Click here for MPEG-2 Audio version of Meditation, 2:51 / 667K. Following her competition-winning performance of the Shostakovich Second Piano Concerto at Boston's Jordan Hall, Christopher Swan of the Christian Science Monitor remarked: "She wasn't good; she was amazing. Miss Wellspring is a gifted pianist ... what she has you can't pay for or acquire with assiduous effort -- a voice of her own and an electric intensity as a performer." Barbara made her orchestral debut at the age of 16 in her native state of Washington. She has performed with the Dance Theater of Harlem Orchestra on Broadway, and engagements with the Vermont Philharmonic. 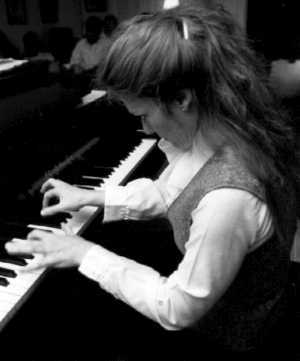 A successful competitor in the 1973 Artists International Auditions, Barbara was presented in her New York debut at Carnegie Recital Hall the following year. A scholarship student of Zenon Fishbein, Barbara received her Master's degree from the Manhattan School of Music in 1972. Other teachers have included Gary Graffman, as well as Anthony di Bonaventura in conjunction with the doctoral program in performance at Boston University. In 1983, Barbara was a featured artist in the New England Performing Arts Showcase, and a finalist in the Boston Pops auditions. Barbara's recital credits include engagements in the major halls of New York and Boston, numerous radio appearances including "Morning Pro Musica" and school and community programs throughout the U.S. A member of the Vermont Council on the Arts Touring Artists Register, Barbara enjoys a widening reputation for her specially-designed programs combining performance and commentary. Recently she has developed an innovative listener-choice format which she calls The Classical Sampler. Barbara now performs her own works. Written in a manner that is largely "channeled", she describes her style as a New Age-Classical fusion. Barbara is currently producing her second album, "Out of the Blue", following "Celebrations of the Heart" in the winter of 1992. 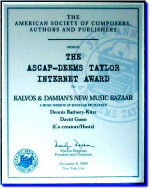 Her solo piano or keyboard music is being published by Edel Publishers of Burlington, Vermont. Her commentary: "When I started composing four years ago quite out of the blue, I knew the music had a spiritual purpose and message. This music is not mine in the sense of possession or ownership, but belongs to everyone -- I happen to be the body and spirit through which it is manifest. People say it helps them heal, relax, feel soothed, nourished and uplifted, and connected with their inner being. This music, which is part of the new consciousness of Love and Light, is the fusion of New Age and Classical elements. I am privileged to be the instrument through which it is channeled to others."